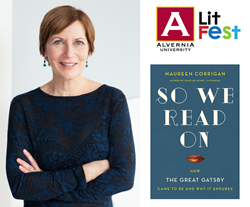 Alvernia University will host NPR correspondent and book critic, Maureen Corrigan, in the university's historic Francis Hall on Wed., Feb. 24 to discuss her book “So We Read On: How the Great Gatsby Came to Be and Why It Endures,” for the university’s annual Literary Festival. A reception with the author will begin at 5 p.m., followed by a lecture at 6:30 p.m. In addition to more than 20 years as a book critic for NPR’s “Fresh Air,” Maureen Corrigan serves as a columnist for the Washington Post and is an associate editor of and contributor to Mystery and Suspense Writers and winner of the 1999 Edgar Award for Criticism, presented by the Mystery Writers of America. She has written reviews for the New York Times, the Boston Globe and The Nation among others, and is a critic-in-residence and lecturer at Georgetown University. As both a respected journalist and author, Corrigan served as a juror for the 2012 Pulitzer Prize in Fiction. Corrigan’s book “So We Read On: How The Great Gatsby Came To Be and Why It Endure s” offers an interesting perspective and depth about Gatsby by delving into archives, high school classrooms and onto the Long Island Sound. Her book challenges readers to re-examine Gatsby’s rocky path to recognition as a “classic,” and its profound commentaries on race, class and gender. “So We Read On” was named one of the 10 best books of the year by Library Journal. ALVERNIA is a thriving university that empowers students through real-world learning to discover their passion for life, while providing the education to turn what they love into lifetimes of career success and personal fulfillment, helping them make the world a better place. Situated on a scenic 121-acre suburban campus in historic Berks County, Pa., the university of more than 3,000 students is conveniently located near Philadelphia (60 miles) and within an easy drive of New York, Baltimore and Washington, D.C. With a College of Arts and Sciences and College of Professional Studies, Alvernia today offers more than 50 undergraduate majors and minors and a range of graduate programs at the master’s and doctoral levels through its School of Graduate and Adult Education.